I have just had a quick look at my portfolio for the 3 months to the end of March so thought I would post the results. The FTSE 100 is up 8.7% since the start of the year - if we add on another say 0.8% for dividends paid, this will give a ballpark figure of 9.5% total return for the quarter. Personally, I don’t compare my returns to any benchmark - maybe I should do - but the FTSE 100 is a commonly used benchmark with many fund managers. My portfolio is allocated between fixed interest (40%) and equities, which in turn are divided between individual shares and investment trusts. The higher interest from the PIBS and fixed interest sector are mainly paid in the second and fourth quarters, so returns in the past 3 months have been negligible and this sector has returned only 2.3% over the quarter. Individual shares fared much better, providing a total return of 9.5% over the 3 month period. The better performers were Reckitt & Benckiser (21.7%), Dialight (21.4%), IG Group (19.7%), and Unilever (18.6%). On the naughty step were Carillion (-14%), BHP Billiton (-8.3%) and Imperial Tobacco (-4.1%). Once again, my individual shares sector has been beaten by the professionally managed trust sector which returned 11.1% - the better returns came from smaller companies specialist Aberforth (17.9%) - also Bankers (13.7%), Edinburgh (13.4%), Murray Income (13.4%) and Murray International (13.1%). The only trust not to make much headway over the 3 months was New City High Yield. As a whole, the portfolio has advanced 7.5% over the first quarter including the payment of 0.8% income. I have no idea where the markets may be heading over the next quarter, we have the new ISA season starting next week so this may provide some further support for equities. The one thing I do know is the income returns for both fixed income and equities will be considerably higher over the next 3 months and should take returns for the half year up from 0.8% to 2.5% and the forecast for the full year is 5%. I would be interested to hear how others have done over recent months - leave a comment if you keep track of your portfolio. Meantime, have a good Easter break! Abbey is a small AIM listed company and is the leading supplier of specialist legal and professional fees insurance to small and medium UK companies. One of their divisions supplies specialist policies to cover the cost of professional fees involved in tax investigations. As we saw in last weeks budget, the government are keen to crack down on tax evasion and HMRC are stepping up their efforts to secure more tax revenues from some of the UK's wealthiest individuals. Abbey’s CEO, Colin Davison has described these tax investigations as very good for his business. Abbey is the smallest holding in my portfolio with a market cap of around £115m, it is conservatively managed and has net cash on the balance sheet. As with many of the shares in my portfolio, the attraction is the fast growing dividend which is supported from quickly growing revenues and profits which have advanced in each year since the company floated on the AIM market in 2007. Abbey have today issued their full year results for 2012. Here’s a link via Investegate. Despite some challenges anticipated last year, they appear to have put in a reasonable performance - revenues up 7% and a 3% increase in pre-tax profits. The company is debt-free and a further £3.3m (12%) has been added to the balance sheet. The dividend has increased just over 11% from 4.4p last year to 4.9p giving a yield of 4.4% based on the current price of 112p. The dividend is covered 1.6x by earnings - I would not want to see it any lower (a reduction from 1.7x cover last year). The share price has had a good run this past year - up 45% on the 77p at the same point last year - there is little movement following the results and I would guess the current price is just about up with events for the time being. The main item of note seems to be the securing of a licence to become an Alternative Business Stucture following deregulation of the legal services market. They have now aquired a firm of solicitors which will enable Abbey to provide a wider range of services to existing and new clients. The board seem confident in their outlook for the coming year, pointing to significant opportunities for their specialist tax and legal services. The directors all have a significant holding of shares which closely alignes their interest with the success of the business (and small shareholders!). I am hoping there will be plenty more to come from this small cap over the next few years. As I have mentioned in previous articles, last year I converted my sipp to income drawdown and several shares were sold to provide the funds for the 25% tax-free lump sum. I decided the remaining individual shares were too few to be adequately diversified so decided to dispose of the remainder and reinvest the proceeds into more investment trusts. As I need a reasonable level of income to cover the annual drawdown, I decided to include a couple more investment trusts from the UK growth & income sector. They have just issued their report for the 12 months to 31st January - here’s a link via Investegate. The headline is that NAV per share on a total return basis has increased 18.8% - ahead of its benchmark the FTSE all-share index which increased by 16.3%. Over the past three years (to date), the sp total return is up a respectable 54%. Looking a little deeper into the report, I am a little concerned to see a dip in the revenue reserves of -7.8% to £19.9m, however, this is still more than covering the full dividend paid for the past year. Total income declined by 1.6% for a variety of reasons - no special from Vodafone, currency exchange and less benefits from writing options - and the board are recommending a below inflation rise in the dividend for the year of only 0.9% to 10.75p - having said that, this will still provide a dividend yield of 4.2% based on the current share price of 255p. The CAGR over the past 10 years has fallen to just 4% - one of the lowest in my portfolio - so I think the manager has quite a bit of work still remaining to get this figure back above the 5% mark (Murray International is 9.5% by way of comparison). The manager is moving the overall portfolio more towards growth which will mean lower absolute income in future years but potentially faster growth of revenues. Although it is in the UK growth & income sector, I like the 20% contribution to income from overseas holdings. The manager, Jeremy Whitely, seems happy that the portfolio is in good shape and says he is not prepared to compromise on quality in the search for value. Portfolio turnover is minimal and the transaction costs are only 0.05% of NAV (these costs for the average fund are over 1%). I am content to continue holding for the time being but will be looking for some progress on income growth above inflation combined with a boost to reserves at this point next year. Nichols - makers of soft drink Vimto - have been on my watch list for quite a while. I think it may be time to take the plunge with my customary 'half' now and 'half' at some future point. The company started off in Manchester in 1908. They first listed on the Manchester stock exchange in 1961 and transferred to the AIM market in 2004. They have expanded quite rapidly over recent years - in addition to Vimto, now selling in 65 countries, their brands include Panda, Sunkist, Levi Roots and most recently, a Weight Watchers range of soft drinks. Earlier in March, the company issued its results for 2012. Sales increased 9%, profits were up 13% and once again they were able to increase the dividend 13% to 17.3p ( one of the reasons for buying now would be to qualify for the final dividend of 11.7p). The recent surge in the share price has increased its market cap. to over £300m. If it were listed on the main market, it would be just about eligible for the FTSE 250. Around 80% of sales are generated in the UK and the remaining 20% from abroad, mainly Africa where sales increased 22% (and 28% in 2011), Middle East and mainland Europe. They have recently started a sales channel in China which could obviously be a huge market. Last year they were awarded the prestigious Queens Award for International Business. For the second year running they were nominated for AIM company of the year. The share price has had a very good run in recent months - up from around 700p last June to currently 876p (25%) - so I would not be surprised to see some consolidation in the short term. However the management seem confident they can continue progress with new products in the pipeline and continued investment in strong brands combined with expanding the business overseas. The balance sheet appears strong and the company has a net cash position of £24.7m - up from £20m in 2011. As this is an AIM listed share, I will need to hold it outside of my ISA - however, I am hoping from next April the Chancellor will permit AIM shares to be included - as well as the abolition of stamp duty on their purchase! One other point of note - many AIM listed shares can be used as a means to avoid or reduce Inheritance Tax (IHT) provided they are held for 2 years. The IHT limit has been frozen at £325,000 for the next five years which means many more people will come within this limit, particularly if property prices start to take off. Savvy investors (and their advisers) may increasingly look at AIM listed shares and their prospective saving of 40% tax as part of their future plans. Permanent interest bearing shares - PIBS - are issued by building societies as a way of raising capital. They are listed on the stock exchange and can be traded much like any other security. The main attraction for income investors is the higher rate of interest on offer - typically 6% - 8% at current prices. They pay a fixed rate of interest (coupon) every six months and although it will be taxable just like interest on a deposit account, it is paid gross so if held within a pension, sipp or ISA, there is no tax to pay. Also useful if you are a non tax payer. The purchase process is a little different from shares and funds - for a start, you cannot buy directly online, you will need to give your broker a call and deal via a telephone trade. With some brokers, this will be more expensive - for example my broker, Sippdeal charge £20 more for a telephone trade. This is offset by the fact there is no stamp duty to pay. The other aspect is you will need to allow for the additional cost of the accrued interest since the last payment - you will, of course, get the full 6 months interest on the next payment date. In 2007/08 at the start of the economic banking meltdown, some of the former building societies which had demutualised got into difficulties and many investors holding PIBS in the likes of Bradford & Bingley and Northern Rock lost money. The holders of PIBS rank behind all other lenders and depositors and whilst ordinary savers are protected by the FSCS for the fist £85,000 of savings, no such protection is afforded to holders of PIBS. Anyone considering them as a possibility should therefore ensure they are satisfied regarding the strength of the building society issuing the PIBS. The other main consideration is that, unlike conventional bonds, many PIBS do not have a fixed redemption date. Some will have a ‘call’ date but whether the PIBS are redeemed will be at the issuers discretion. Prior to 2008, it would have been almost unheard of for a building society not to redeem its PIBS on the call date - more recently we have seen a number of societies choosing to ‘reset’ the rates at much lower levels, often just 1% or 2% above the interbank lending rate (LIBOR). This can have the effect of reducing yields from 7% or 8% down to 2% or 3%. Another option taken by the Nationwide BS recently is to offer to buy back the PIBS near to the call date at below the issue price, but above the then market price. As with all fixed interest investments, the level of income may be attractive at the start - especially compared to savings rates - but as the income never rises, it will become worth less over time due to inflation. When the Bank of England throws more and more money into the system in the form of QE and Funding for Lending Scheme, there is always the danger this will cause inflation to rise. I have taken a calculated punt on PIBS for some of the fixed interest portion of my portfolio - the main holdings are with the Coventry BS (see post) and the UKs largest mutual, the Nationwide. As I said in “DIY Pensions”, I am currently looking for opportunities to diversify so could well reduce the proportion of some PIBS over the next year or two. Some of the retail bonds for example could be worth taking up. I will take a look at other forms of investing for fixed interest in a future post. As ever, please DYOR - a good place to start is the excellent Fixed Income Investment website run by Mark Taber. This is another of my shares originally held in my sipp but sold last year to release the tax-free lump sum and subsequently repurchased in my ISA. Sky is installed in over 10m homes in the UK and Ireland offering a comprehensive multi-channel choice of movies, news, entertainment, arts and sport. Customers have access to 500 TV and radio channels as well as 20 mb broadband and free evening and weekend calls via Sky Talk. The business first launched in 1989 and floated on the stock market in 1994 entering the FTSE 100 the following year. The business has grown rapidly and currently has a market cap of over £14bn - more than double the size of, say, Sainsbury or M&S and over 3 times larger than competitor ITV. As the company has grown, so have profits and dividends for shareholders. In 2004 they paid a dividend of 6p per share, last year it had risen to 25.4p. That an impressive CAGR of 17.4% per year. Sky recently issued its half year results for the 6 months to end December 2012 and it looks like they are on track for another good year. Here's a link to the interim results. Profits have increased by 8% to £647m and there's also a 20% increase in the interim dividend from 9.2p to 11p. The dividend is covered 2.5x by earnings per share of 28.3p. Despite the tough economic conditions, Sky has signed up more customers and those customers are spending more money on such services as broadband, Sky Go and use of On Demand. The share price has now recovered to the sort of levels seen a couple of years back when Murdoch’s News International had to pull out of a proposed takeover bid following the phone hacking scandal at the News of the World. If the final dividend is increased in line with the interim, this will raise the full year payment to 30p giving a forward yield of 3.4% based on a current share price of 883p. The full year results are due in July. As ever, please DYOR (and stay warm...). Page views to date - 3,200, average per day is now around 120 - 130 mark. Most viewed article - Asset Allocation with 460 however this was mainly due to a mention by Monevator! Other popular articles are Keep it Simple - Egg & Chips Investing (68), Dividends are the key..(65), and Start Early - Compound Returns(64). The main sources of referring sites have been Retirement Investing Today, Monevator and Money Saving Expert - many thanks! Obviously, the majority of people visiting the blog are from UK (90%), however I was a bit surprised to see how far diy investor has reached globally - USA (3.5%), Germany (1.5%), France (1.0%), Netherlands (0.8%), Belgium (0.7%), Japan (0.7%), Australia (0.7%) - also Angola, India, Ireland, China, Serbia, Belize and New Zealand. I’ve heard the majority of blogs only survive for around 3 months, but as I am enjoying doing this so far, I hope to carry on a little while longer! I wanted to start off with what I consider to be a few of my basics on investing, which I hope may be useful to new investors and possibly others - its encouraging to see it’s the second most viewed tab. I probably don’t want to get too far away from egg & chips with this section, but will probably cover a few more areas as they arise. I have started posting articles relating to my own portfolio - individual shares, investment trusts and fixed income - mainly as results are released and have recently set out the core of my investment trust portfolio to monitor as a long term project. I may well do something similar with my higher yield shares portfolio. I’m still trying to get my head around some of the more technical aspects of running a blog - so far, I’ve managed to create a table to list my portfolio and have found a few images to illustrate some of the tabs. Greggs is the leading bakery retailer in the UK, with over 1,650 shops throughout the country, serving freshly baked food to six million customers each week. They are one of the largest employers in the UK and employ over 20,000 staff. They benefit from a profit sharing scheme and this year, 10% of profits - £5.8m will be shared out. Founded by John Gregg in Gosforth over 60 years ago, they floated on the market back in 1984 and have a great record of increasing dividends to shareholders in each of the past 28 years. Two years ago, they decided to expand the business by entering the motorway service via Moto Hospitality and things seem to be going well as they have now expanded to 30 sites. Additionally, they are also expanding into frozen foods with their ‘bake at home’ range via 750 Iceland stores - so far, sales have exceeded initial expectations. The share price fell at the end of 2012 when CEO Ken McMeikan announced his intention to move on. In January, Roger Whiteside took up the reins - formerly CEO of Punch Taverns and prior to that head of food at M&S and also a founding member of Ocado. He knows Greggs well having been a non-exec board member since 2008. They have today announced full year results for 2012. Although total sales were up 4.8% to a record £735m, this was mainly due to new store openings - like for like sales were down 2.7%. The dividend has increased by 1% over the previous year to19.5p and is covered 2x by earnings. The dividend has increased at a rate of 8% CAGR since the 8p paid in 2003. At the current price of around 495p the yield is 3.9%. The business is very cash generative and at the end of 2012 they had net cash of £19.4m. Obviously its been a challenging year but the board remain optimistic and have a strategy to develop new markets via wholesale and franchise agreements. Here’s a link to the full year results. Mr. Market does not appear too impressed - at the time of posting the price is down around 5.5% in early trading. Despite this, the share price is still 10% ahead compared to the 454p at the start of 2013. Greggs is a fairly recent addition to my income portfolio - I like the strong brand and the fact they are both baker and retailer, a combination which should prove resilient over the long term. Hopefully, the management can convert the new strategy into more profitable growth and dividends can keep ahead of inflation in future years. Some might describe this company as a little boring - fine by me so long as they continue to keep a close eye on costs and deliver rising profits and dividends. I have been with Sippdeal as my sipp provider for many years. Last year, I transferred my ISA to them following the introduction of platform charges by Interactive Investor. One area I found a little lacking with the Sippdeal site was the lack of research facilities - not really much of a problem as I could carry on using the ii site or Digital Look - so I was pleased to receive an email today with news of the introduction of more research tools in conjunction with Morningstar. I am pleased to let you know that on Friday 22 March we will be launching our improved Research centre which has been developed in conjunction with Morningstar, a leading provider of independent investment research. Easier access to comprehensive investment research. Each investment ‘type’ available online (fund, ETF/ETC, investment trust and equity) will have its own page, making it simpler to research the investment you are interested in. ‘Quickrank’. Arrange and view investments based upon a number of filter options, including their fees, charges and performance. You will be able to quickly filter and access research on more than 7,000 funds, 1,200 ETFs/ETCs and 600 investment trusts. ‘Screener’. Arrange and view funds, ETFs and investment trusts based upon a number of filter options. These include the investment type, performance, risk and Morningstar ratings. Equities can be filtered according to the chosen exchange, performance and risk. X-ray analysis. The ability to review model portfolios by identifying key areas such as performance, asset allocation, sector exposure, geographical distribution and style. Model portfolio functionality. Create model portfolios using a number of selection criteria. Looks like a useful addition to the site. I thought it may be a good long term project to monitor the progress of this portfolio as if it had been started on 1st January 2013 so I have taken the closing prices for each investment trust at the end of 2012 and allocated a nominal sum of £2,000 to each. Last year, I moved my sipp into income drawdown as I felt I could generate a better income over the long term than taking an annuity. Investment trusts will now generate a large percentage of my drawdown income and hopefully rise each year to keep pace with inflation - a sort of index-linked annuity substitute. The core portfolio is selected from the growth & income sector - both UK and global - and also includes some of the higher yielding trusts from other sectors including global growth, far east (ex Japan), smaller companies and some fixed interest. Here’s the portfolio with current price valuations and also a small amount of accumulated cash from dividends. I will keep a record of dividends as they are received and, from time to time, reinvest these either into existing trusts or possibly one or two additions to the portfolio. Over time, this should provide a demonstration of the effect of turbo-charging the portfolio returns. Over the long term, investment trusts have demonstrated their ability to maintain a good record of paying a steadily rising dividend through good years and bad. Indeed some of the trusts in the portfolio have delivered a rising income for decades - City of London 46 yrs, Bankers 45 yrs, Murray Income and Temple Bar 29 yrs. The reason they can do this is because they hold back some of their income in revenue reserves in the good years - up to 15% - and use these reserves in poor years to smooth returns for the investor. Most investors will concentrate their investing firepower on the large quality companies that make up the FTSE 100. Institutional investors such as pension schemes tend to focus on this sector on the basis that the smaller companies are more risky and less well researched. Low cost trackers are increasingly popular with small private investors - these will typically track the FTSE 100 or FTSE All Share index (the FTSE 100 makes up around 85% of the all share). Trackers will be a good choice in most situations mainly due to the low costs, however if you want exposure to the lower strata of the UK market, there is no option of tracker (yet!) so the choice will be between individual shares, OEICs or investment trust. In a recent article I looked at the importance of maintaining a diverse portfolio. A good way to do this is by including smaller companies as part of the mix - when you look at the long term comparisons, SC investment trusts or OEICS will usually feature somewhere near the top of the leader board - especially over the longer periods. 2012 was an excellent year according to the Numis Smaller Companies Index (previously Hoare Govett) which rose 30% compared to the FTSE 100 total return of 10%. Although the index was first published in 1987, the data has been recorded since the mid 1950s and over this extended period, smaller companies have enjoyed an average total return of around 15% CAGR which is over 3% p.a. more than the FTSE All Share index. As we have seen (here) small percentages over long periods can make a big difference. NAV total return was 31.9% and share price TR was 43.9% - ( since the start of 2013 the sp has increased a further 17%). The management are very aware of the importance of the role of dividends in generating long term returns. The dividend for the year increased 7.2% to 22.25p giving a current yield of 2.75% at 810p. Although NAV has increased significantly, the management fees and admin costs have been reduced this year and represent around 1.0% TER (including transaction costs). This may in part be due to the lower portfolio turnover rate of 26%. In the same way that spreading your investments between different countries and sectors makes sense, it is hard to argue against having a balance of big and small in your portfolio. 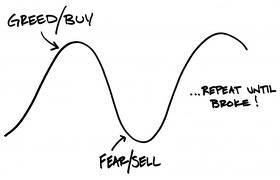 Investing is easy - you buy a share, wait for it to go up and then sell it. If it doesn’t go up, don’t buy it - simples! Markets go up and down - surely it should be possible to buy low and sell high - wait for the markets to fall again and repeat. Sounds good in theory but in my experience, its impossible to achieve in practice. Of course, with the stockmarket on a roll this year, there will be plenty of financial pundits holding forth with their pearls of wisdom on where the markets are heading and sowing the seeds of doubt - the truth is, there are only two types who try to forecast the future direction of the market - those who don’t know, and those who don’t know they don’t know. My advice, for what its worth is to ignore the pundits and forecasters. Warren Buffett knew there was a market bubble developing during the dotcom boom of the late 1990s but he could not profit from this knowledge as he could not tell when the boom would turn to bust. I was recently reading some research on timing by Professor Malkiel, a long-time friend of Vanguard founder John Bogle. The tenth edition (revised) of his best-known book, "A Random Walk Down Wall St", was published last year (Jan 2012) - and since its first edition has sold over one and half million copies. As investors, it's all too easy for our emotions to get the best of us, warns Prof Malkiel. Professional investors are just as likely as retail investors to get it wrong, he insists. Over the 15 years from 1995 to 2010, investors who stayed fully invested secured an annual return of 8.05%, notes Prof Malkiel. 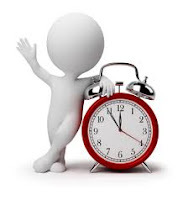 Those who tried to time the markets, but missed the best 10 days in that 15 year period, achieved a return of only 3.15%. Those who missed the best 30 days achieved a negative return of -2.6%. If you agree it will be impossible to time the market by buying low and selling high - many small investors actually do just the opposite - what are the alternatives? For me, the best strategy has been to drip feed new money into my equity investments on a regular basis - as a result I will be buying when the market is low or high and many points in between. Last May and June, I was buying investment trusts when the FTSE 100 had fallen below 5,000. I have just bought some shares in Aberdeen Asset Management when the FTSE 100 had just gone above 6,500 - a 30% rise in less than 12 months. When there are obvious market downturns, I may accelerate the buying or sell some existing fixed interest securities to take advantage of the higher yields available on equities. As a rough rule of thumb, if the markets (FTSE 100) are 15% below their peak of the previous 12 months, I will be looking to accelerate the buying - likewise if it is 20% above the low point of the previous year (like now), I will ease back a little and wait to see if the markets pull back. I’m really not sure whether this strategy has produced any better results than a constant monthly drip feed - possibly not - also, I’m not suggesting this as a strategy for others, merely outlining my own approach. Of course, over the long term, the point at which you buy an investment should become less important, especially if you are reinvesting dividends to turbo-charge portfolio returns. Around this time last year Aberdeen Asset Management made its debut in the FTSE 100. The business model is fairly simple - increase assets under management (AUM), keep a tight control on costs and grow profits. Most small investors would be better off investing via low cost trackers like Vanguard, however, no matter how much this message is repeated, there will always be investors ready to be seduced by the advertising of the financial services industry. So long as there is a demand for their services, the likes of Schroders, Henderson, F&C and Aberdeen can grow profits and therefore can themselves be a decent investment. Aberdeen have a good range of funds and investment trusts, many of which have produced consistently good returns - some I hold are Murray International, Dunedin Income Growth and Murray Income. They has been on my watch list as a potential purchase for quite a while and yesterday, I decided to add a ‘half’ holding to my portfolio at the price of 425p (cue for sp fall!). With new additions, I generally look to start off with a smaller initial stake and add to it later based on results, dividend increases and share price movement. If the markets continue to improve, I would hope to see the likes of Aberdeen make further progress as they should attract more inflow of new money and funds continue to increase net assets. Half year results are expected end April. Revenues increased 11% to £869m and profits were up 15% - assets under management increased 10% to £187bn. The figures that caught my eye were the increase in dividend from 9p last year to 11.5p - an increase of 27.7% (covered 2x by earnings), following on from a 28.5% increase the previous year. Secondly, the doubling of net cash to £226m which further strengthens the balance sheet. As usual, I regret not having bought earlier - at the time of the results the share price was around the 340p mark and yield over 3%. The current yield is near to 2.8%, however I have pencilled in a dividend of 13.5p for the coming year which will lift the forward yield to 3.2%. Dividends have more than doubled since the 5.5p paid in 2007 - the increase is an impressive 15.9% CAGR. If they continue at a similar rate, the dividend will double every 4.5 years. Obviously management of funds connected to the financial markets will be cyclical and I expect the share price to be a little more volatile as a result but I think over the long term ADN has reasonable prospects given the impressive track record of recent years. In a recent article, I looked at the importance of asset allocation here. I have around 60% in equities and 40% in fixed interest securities such as PIBS, corporate bonds etc. The equities are divided equally between individual higher yielding shares and investment trusts. The shares I hold are a mixture of large, medium and small cap - the largest is probably GlaxoSmithKline (GSK) with a market cap of around £70bn and the smallest is AIM listed Abbey Protection with a market cap of around £110m. The shares are selected from over 15 different sectors of the market such as media, mining, supermarket, utilities, general industrial etc. I hold several investment trusts - some from the UK growth & income sector, some from the global growth & income sector like Murray International (MYI article) as well as a couple of trusts focussed on Asia and the Far East, I also have a couple from the global growth sector like Law Debenture (LWDB article) and for exposure to smaller companies I chose Aberforth. 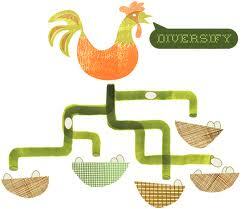 The point is, its not generally a good idea to put all your eggs in one basket. Pooled investment vehicles like investment trusts, exchange traded funds and OEICS, will typically hold one hundred or more individual shares and these are a simple way to diversify your portfolio. Indeed with the broadly diversified Vanguard LifeStrategy fund you have the option of a one-stop investment vehicle providing all the diversity and balance that may be required. Personally, I would never place all my investments with one fund or even several funds with just one provider. I like to spread the risk - some shares, some professionally managed investment trusts. I like some large, higher dividend paying shares and some smaller, faster growing companies. I like exposure to different sectors of the economy and to the faster growing emerging markets. However, some would argue it is possible to be over-diversified. According to modern portfolio theory, holding around 15 to 20 shares is around the optimum for adequate diversity and adding further shares has very little effect in reducing risk. Legendary investor Warren Buffett suggests that if you diversify too much you might not lose much but equally, you won’t gain much either. His approach is to concentrate on companies he knows inside out and select a few well researched options out of which there is the expectation of some big ‘winners’. This company have their origins way back in the 19th century - Johann Benckiser founded an industrial chemical company in 1823 and Isaac Reckitt started a starch mill in Hull in 1840. Reckitt & Sons were first listed on the London Stock Exchange in 1888. In 1938 they merged with mustard makers J&J Colman to become Reckitt & Colman. In 1999, the companies merged to become Reckitt & Benckiser. They now claim to be the world #1 in household cleaning. They have a range of ‘power brands’ - Cillit Bang, Durex, Dettol, Finish, Gaviscon & Nurofen - recession or no recession, people keep cleaning their kitchens and getting headaches. I normally have a limit of 10% for any single share in my portfolio however, due to the recent share price surge, Reckitt has just tipped over this limit so I will need to keep a close eye on this and look again at the half year mark in June. Last month Reckitt reported full year results for 2012 - steady progress but nothing spectacular - just the way I like it. They reported a good performance in developing markets, with sales in Asia, Africa, Latin America and eastern Europe more than offsetting weakness in western Europe and North America. They are proposing an 11% increase in the final dividend from 70p to 78p which will mean a full year dividend of 134p and yield of just under 3%. Now 3% return is below the average for the FTSE 100 so it could be argued you would get a better return on a tracker. However, the reason the yield is 3% is due to the strong share price rise, currently over £46 - up around 20% so far this year - if the price had remained fairly static since the start of 2013 - £38.75 - the yield would be nearer 3.5%. The divi has more than doubled from the 55p paid in 2007, growing at the rate of 16% (CAGR) - if it continues at a similar rate in the future, the dividend will double every 4.5 years. As an income investor, I would rather have a smaller percentage of a faster growing pot. I have pencilled in 145p for the coming year. New CEO, Rakesh Kapoor is making progress with plans to refocus more towards the faster growing emerging markets like Brazil and India and has set a target of these EMs to become 50% of the core business by 2015. This is, in my opinion, a quality operation and one of my better investment decisions. I can imagine holding RB for quite a while - for me it would just about represent the epitome of a long term buy & hold share. When I first started investing seriously in the early 1990s, I read a few books and the almost obligatory Investors Chronicle and made a few notes in the back of my investment notebook. Some years later, after the dust had settled from the so called dot-com crash, I re-read my notes and began to understand the concept of asset allocation. At the time, like many other small investors, I had been sucked into the technology bubble of the late 1990s - all of my investments were equities and included a rather high proportion of tech shares. 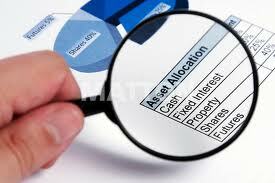 Asset allocation is really a question of looking at the possible options and deciding what proportion of your investments to put in each one. The usual classes of asset are equities, government bonds (gilts), corporate bonds and fixed interest securities, commodities such as gold and silver, property and finally, cash. A classic allocation is 60% equities and 40% bonds. My current allocation is 60% equities and 40% corporate bonds, pibs and fixed interest. There is no such thing as a perfect asset allocation - each person should decide on the best mix, and of course, the mix between different classes of asset can vary over time. One rule of thumb is to hold the same percentage of bonds as your age - so at age 30 years, it would be 70% equities and 30% bonds. At age 50 years, a 50:50 mix etc. Tim Hale, author of “Smarter Investing” suggests 4% in equities for each year you intend to be investing - the remainder in bonds. Personally, I’m not a big fan of gold, mainly because it does not provide an income - other people will hold a significant percentage in their portfolio as a hedge against currency devaluation. If I were in my 20s or 30s, I could well decide to choose 100% equities, after all, they are the most likely to provide the best return over the longer period. This is asset allocation - its just that I have chosen to allocate 100% to equities. Obviously there will be no need to rebalance. Say I choose 50% equities, 25% gilts and 25% corporate bonds - and say at the end of the year equities have done very well and have increased to 60 % of the total portfolio value. This would mean the gilts and corp. bonds represent only 40%. The idea of rebalancing is to restore the original balance of 50:25:25, therefore I sell some of my equities and reinvest the proceeds into bonds and gilts. The overall value of the portfolio has increased but the original allocation percentages are always restored at regular intervals. One of the benefits of spreading your investments across a number of different asset classes is the reduction of volatility. If you are invested 100% in equities and there is a sudden downturn in the markets, you could easily lose 20% or 30% of the value of your portfolio in a very short period of time - witness late 2008! However, if your investments are mixed between equities, gilts and other fixed interest securities, it is more likely the loss will be more like10% or 15% which should make it a little easier to ride out the storm. Vanguard are very popular and offer a good range of equity and bond trackers Vanguard trackers . They also offer the increasingly popular LifeStrategy range ( here ) which combine equities and bonds in one fund according to the level of equity exposure you require - furthermore, the fund is automatically rebalanced on a regular basis. Asset allocation is a mechanism for balancing the elements of risk and reward and is one way of ensuring an element of diversification - in a future article, I will look at other ways to spread risk. Conventional wisdom says investing in equities is more of a risk than bonds. Well, if you are dipping in and out of the stock market trying to time your trades, you will almost certainly get caught out sooner or later so, yes more risky. If you’re paying over the odds in charges on your investments, your returns will suffer so, yes - again more risky. If you are hoping to make a quick profit on the markets over the next year or two, again you may be lucky but the chances are you will run a high risk of losing some of your investment. Finally, you choose low cost investments, your money is being drip-fed into your investments on a regular basis - your plan is to invest for the long term… sounds good so far….suddenly, out of the blue, the stock markets turn negative, your investments lose 20% of their value within days…panic, anxiety - what to do - sell now? Maybe hold on a while - sell when you get back to somewhere what you paid? Sell half now and keep your fingers crossed the remainder will turn out OK? I believe this aspect is one of the key reasons why many private investors fail to achieve more success from their investing and this is why having some understanding of volatility of both the markets in general as well as individual shares is one of my 5 ‘basics’. When anxiety and fear suddenly enter the arena, its far more difficult to think rationally and make the right decisions. As a species I guess we are not very well equipped to deal with uncertainty, so perhaps the answer is to approach investing from a position of absolute certainty - markets will go up… and then go down. The other certainty is that no matter how far the markets fall, and then fall some more, in the long run they always bounce back. In the UK, we tend to focus on our own little corner of the World - in stock market terms, this usually means the FTSE 100. There are some pretty large companies listed on the FTSE - HSBC Bank, Vodafone, Shell Oil, Tesco - are familiar names. However, the UK market makes up only around 8% of the global stock markets which are dominated by the USA with 45%. Other significant markets are Japan 7%, Canada 4%, rest of Europe 16%, Australia 3% - surprisingly China only accounts for 2%. (Source - Credit Suisse Yearbook). Markets rise and fall - often there is no obvious reason - just look at the rise of around 10% on the FTSE in the first couple of months of this year - why? These global markets are all closely interconnected and will tend to rise and fall in unison taking a lead from the dominant market of USA. Of course, we all like to know why things happen the way they do and we like to see patterns which may give us a clue as to how things will pan out in the future - its probably hard-wired into human DNA. All I’ve been able to work out is that markets are volatile - sometimes they go up and sometimes they are flat within a range and sometimes they fall. If you are investing on the stock market to secure a better return than cash deposits, you need to accept this volatility as part of the deal. The big light bulb moment in my investing career was to make the distinction between prices - markets, shares etc. - and yield, pretty obvious really. So, markets and share prices are volatile - for the day trader, this is where the action is, however as a total contrast, dividends are the sleepy backwater of the stockmarket, a positive oasis of calm. With most of the higher yielding shares and particularly investment trusts in my portfolio, the dividends are paid out on a regular quarterly of half yearly basis. Every year they increase a little to keep pace with inflation - maybe a little ahead. Even through the financial storm of the past 5 years, most have managed to maintain progressive payments. I have therefore learnt am learning to pay little or no attention to market ‘noise’ and the ups and downs of the prices - my focus will be on dividends and their rate of increase - this is my strategy for coping with volatility - maybe it could be useful for others. So, to return to the opening sentence, conventional wisdom says equities are more risky? Not in my book - so long as you can manage the risk and accept volatility. Keep it simple, stick to what you know. I know equities give me a better return than cash - they give me a better return than gilts and the rising dividends provide a hedge against inflation. Thats not to say all my portfolio is invested in equities, its actually around 60% and in my next article, I will cover the important area of asset allocation. In the meantime, over to you…. let me and other reader know how you deal with volatility. In my ebook “DIY Pensions”, I described the situation of two people, Alex and Sue. Sue started paying £2,000 per month into her pension from age 25 yrs and continued for 10 years. Alex started paying the same amount 10 years later than Sue and continued for 30 years. Sue paid in a total of £20,000 and Alex a total of £60,000. At retirement, Sue’s pension pot was £100,000 more than Alex’s! The dramatic effects of this outperformance of Sue's fund are entirely due to the magic of compounding returns over a longer period - with a pension or investment, it will be the compounding of reinvested dividends - with cash savings, it is the effect of compounding interest on previous years interest. So, whether you are saving in a pension or a stocks and shares isa or a cash isa, the principle is the same - the sooner you can start saving, the more time your money will have to compound and grow. Albert Einstein described compound interest as "the greatest mathematical discovery of all time". 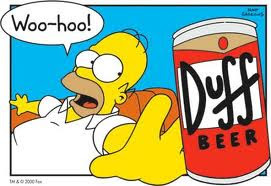 For Homer Simpson, the greatest discovery would be "Beer, the cause of, and solution to, all of life's problems". Here’s a simple spreadsheet setting out the compound returns on savings of £50 per month over various periods ranging from 10 years up to 50 years. The rate of 2.5% roughly equates to current average cash deposits, 5% roughly equates to long term returns on equities without reinvesting dividends and the final figure of 9% is for long term returns on equities with dividends reinvested (allowing for minimal charges). As you can see, seemingly small differences of 2% or 3% per year on the rate of return on savings or investments can make a huge difference to the final outcome. Equally, if you can save 1% or 2% on costs and charges in relation to investments, this will have the same effect. I have used the figure of £50 per month as an example but obviously each person will have different levels of income and expenditure - the harder you save and the earlier you start, the better the outcome. For equity income investors, assuming you do not require income to live off, it will definitely pay to reinvest the dividends. This extra recycling of the 3% or 4% will have the effect of turbo-charging your portfolio returns. So, in this mini series looking at my basics of investing, I have covered the importance of thinking long term, avoiding high charges, the role of dividends and now the effect of compound returns. In the next instalment I will take a look at understanding the volatility of the stockmarket. Last year I converted my sipp to income drawdown and several shares were sold to provide the funds for the 25% tax-free lump sum. When I looked at the portfolio a little while afterwards, I decided the remaining individual shares were too few to be adequately diversified so decided to dispose of the remainder and reinvest the proceeds into more investment trusts. I already had several from the growth & income sector so decided to look at one or two of the global growth trusts which also provided a reasonable level of income and Law Debenture seemed to tick most of the boxes I wanted - good track record, low costs, diversified, solid reserves etc. In addition to the investment trust, it also has a fiduciary services business which contributes to overall profits but the value of this business is not accounted for in the trusts NAV. According to the latest results issued last week, earning from this business were 6.7p per share - if we use a fairly conservative p/e of 10, this would value the fiduciary business at 67p per share. This would give a NAV including dividend (currently) of £4.96 - the share price of £4.63 would therefore be at a discount to NAV. The investment trust has been managed by James Henderson (Henderson Global Investors) for the past 10 years - the allocation has a mid cap bias and a significant exposure to manufacturing. Total return on NAV was 19.7% compared to the FTSE All Share TR of 12.3%. It is proposed to increase the dividend by 5.5% to 14.25p giving a current yield around 3%. The share price has increased a further 9% since the start of 2013. The costs remain low at under 0.5% TER and also portfolio turnover rate is low at around 10%. I’m happy so far with my recent addition and I suspect LWDB may well become another of my long term buy and hold core holdings. I have been retired for a little while - well, 5 years now - and rely on the income from my investments to put food on the table and pay the bills. I think many people regard income investing as something to turn to when they are retired and in the earlier years, are better off going for growth investments. Its true that companies which do not pay out dividends to their shareholders can use more of their profits to reinvest in the business and this should lead to faster growth of the company and therefore its share price. I can only speak of my own experience. I tried growth investing in the 1990s and my returns were very hit and miss. In more recent years, I have become a convert to income investing and find the returns overall have been better and more consistent. Long term research into the UK market carried out by Dimson, Marsh and Staunton of London Business School, covering the period 1900 - 2010 showed that a strategy of investing in higher yield shares produced a total return annualised at 10.9% whilst lower yielding shares produced a return of 8.0%. The study also looked at the effect of reinvesting dividends and concluded the cumulative returns without reinvested dividends were 5.0% p.a. but were 9.4% including dividends reinvested. Research carried out by Morgan Stanley Global Equity Strategy Team in 2012, came to a similar conclusion based on studies of the US markets since 1901. They found that compound annual growth rate for equities including dividends was 9.5% compared to 4.9% return excluding dividends. The researched pointed to dividends providing the majority of the investors total return during periods when markets were range bound or falling. Therefore, dividends are an important factor in achieving long term returns from investments. In fact, I might go as far as to suggest that investing via higher yielding investments could be the choice of long term growth investors as well as income investors. The way I look at it is this, the average target return on my equity investments is in the region of 7% or 8% - so if I can secure a yield of 4% or 5%, I’m already more than halfway there. Finally, I am not suggesting dividend/income investing is the ultimate or only investment strategy. The above studies looked at returns and data spanning over a century - over shorter periods, the approach may not prove so convincing, after all, who’s going to be around in 2113 to say “There you are, I knew that strategy wouldn’t work two centuries running”! All I know is that it seems to work for me, for now. Leave a comment below and let me know what strategy works for you. I have long been an admirer of legendary investor Warren Buffett who has been running Berkshire Hathaway with co-founder Charlie Munger since 1965. The fund has a large stake in such household names as Coca-Cola, IBM, American Express and Wells Fargo. Last year they increased their holding in Tesco to 5% and recently acquired Heinz Foods. Remarkably, since 1965, they have generated an average annual return for their shareholders of 19.7%. If you had invested $200 at the start you would now be a millionaire! "A thought for my fellow CEOs: Of course, the immediate future is uncertain; America has faced the unknown since 1776. It’s just that sometimes people focus on the myriad of uncertainties that always exist while at other times they ignore them (usually because the recent past has been uneventful). Since the basic game is so favorable, Charlie and I believe it’s a terrible mistake to try to dance in and out of it based upon the turn of tarot cards, the predictions of “experts,” or the ebb and flow of business activity. The risks of being out of the game are huge compared to the risks of being in it." I like this mutual building society and have been a saver with them for many years. They are the third largest BS in the UK and have assets of £27 billion. Some 5 years back when deposit account interest rates started their journey on the steep downward slope, I started to look around for alternative options for income. I looked at some of the permanent interest bearing shares (PIBS) offered by the likes of the Coventry and Nationwide and liked what I saw and so bought some to add to my fixed interest portfolio. The reputation of PIBS was damaged when the likes of Northern Rock and Bradford & Bingley had to be bailed out. The financial crisis exposed the debt problems of these former mutuals and many holder realised they were not as safe as many had previously thought. Of course, not all financial institutions are the same and the likes of the Coventry appear to have ridden the storm of the past 5 years better then most. Profits are up once again by 49% to £88.5m. As a holder of their PIBS, the item I always look for is their core tier 1 ratio which is an indicator of the strength of the company. In 2011, it was the highest reported of any building society or bank at 22.8% - in 2012, it improved further to 23.2%. They have maintained their high credit rating throughout the financial crisis and are the only major high street bank or building society not to have been downgraded over the past three years. The results and figures are very reassuring and give me confidence to continue holding until redemption. The PIBS are currently priced around the 97p mark and current yield is 6.25% - paid gross every June and December. They are due to be called (redeemed) at 100p in June 2016. I hope to cover PIBS and fixed interest income investing in more detail in future articles. For anyone from Wales, Happy St David’s day!